In the short while I have been introducing The Form Reality Practice of Bernie Prior in South Africa, people have had profound openings. Here are some letters I got in response to events varying from an introductory workshop to a 3 day training. 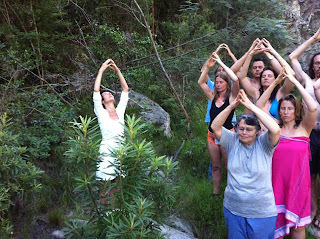 In December 2012, I went deeply into some Reality Moments (short movements from The Form) with 27 women from all over the world during a 10 day training in the wilderness. Here is what Belinda, who was there, wrote me afterwards: "I am loving The Form, and am doing it alot. Not as a discipline, but because it is so lovely, and my Being is wanting it ! I have a constant image of a pyramid in my mind’s eye, a sacred downloading of awareness happening. We have been doing The Form in beautiful places in nature, with our children, and the impact is profound. Our love making has risen to a new level, it is profound, and out of this world ! I am feeling that it is sacred, a Holy act of Devotion, a Gateway to the Divine, and beyond what words can describe. My heart is open. My yoni is open. I am open like never before." "It is with great love that I send you this message. I have been revelling in the sheer exquisite beauty of the divine stillness and sense of peace which I experienced on the retreat. It feels like I finally understand what it means to experience heaven on earth . I feel that I have begun to transcend and transmute the self where I am able to create a new life , unburdened by both the victories and defeats of the past. I feel like I have been born anew, with an opportunity to start with a clean slate and enter a higher state of grace. I have been practicing the form reality meditation a few times a day and I am in awe at the simplicity of how issues are transformed and resolved. I would like to thank you all for opening your hearts to me and to one another and for radiating such love and compassion. " " The Form is such an incredibly beautiful practice. I danced it today for a dear friend whose father has just passed away, and it seemed to me to be the best and most powerful thing I could do for her and her family in this time of deep grief for them." "As I sit (at the) beach under the fullmoon feeling overwhelmingly blessed by LIfe, I am sending you so much love &gratitude for such an incredibly special, intimate &profound sharing as we crossed the threshold of Time together deeper into the reality of NOW. I have slowly been FORMING my way through each family member here& we have been sharing such a harmonious &loving time together...I have been deeply moved &inspired by the simplicity & power of the form practice &can't seem to get enough :) I just want to form EVERYONE!!!" 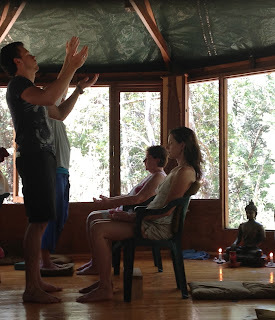 "As I sit here feeling into how to express my gratitude towards you for offering the Form Reality practise right here in the Garden Route, I am amazed at the depth of what has occurred. Words seem an inadequate tool to fully convey how this practice (those amazing four days) has shifted things internally and externally for me! One of the most beautiful realizations is that the simplicity of it, only enhances the depth and profoundness of the Form for me! As you know, I am a deep lover of Truth, so I was at first unsure as to how such a simple moving meditation could bring about the inspiring benefits and changes you spoke of in your email invitation and on your blog. Then, very soon into the retreat, Bernie's words and profoundly penetrating practise began to magically work it's way with me. Each participant became the Beloved...right there in the chair in front of me. The movements carrying me deeply into a sublime Stillness that seemed to radiate within each cell. Words of sharing, after each practice of the Form, began to arise from the very essence of my soul...my body began to float and scintilate at the same time...my heart expanding time after time in a spaceless, infinite expanse that is so exquisite! The shifts feel palpable, even on a cellular level, as my whole body seems to have softened and changed somehow in 'frequency'. Doing the Form (& cosmo form) twice per day since the retreat feels like such a joy...such a gift to mySelf, the other and humanity! It feels that the More of who I am is being honoured each and every time I do the Form. Being in this vibration inspires me anew each and every day - to really open myself in full and total surrender to the Divine - to Existence to the higher plan for me and each one of us! Thank you! Thank you! Thank you!" What I have found is that The Form really is the 'container' that holds me when everything else seems to be in flux ... when my internal harddrive is having a crashing moment from the rewiring taking place inside me. But sometimes it feels like it's not just my harddrive but EVERYTHING within me. "The feeling that I experienced in the silence of my heart, was a feeling of extreme freedom and power to be whatever I desire, to do whatever I desire, uncoloured by what I think I may be needful of. " "After the 2nd time and the 3rd time we did the Form, all floodgates opened and the release was so exquisite! Today, I find myself dropping into my heart centre so effortlessly. Calm & quiet washes over me and all is well with my world :-)"
"At the risk of sounding trite, yesterday was absolutely awesome. When I arrived at Erin Hall, the assembled group appeared very ordinary, and I had an urge to leave. I am glad that I did not.Three hours later, I was not the same person who walked in. My heart was completely open. The depth of feeling was so intense, and I had a feeling of arriving home!" "Thank you for organising a beautiful afternoon and deepest appreciation to Shakti for her clear transmission of truth and embodiment of the divine aspects of the inner masculine and inner feminine! Such a privilege to be around! And what a mirror!! "